When walking down the bread isle of the grocery store you can find an assortment of different tortilla shells ranging in size, ingredients even different health benefits! How did the tortilla, which originated in Mexico, become one of the top bread products sold in the United States? 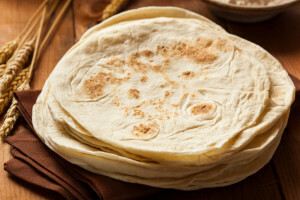 The history of the tortilla can be traced back for thousands of years. Anthropologists have discovered remains that suggest the people of the Sierra Madre Mountains developed corn, adding to their already well-developed cuisine. According to Mayan legend, tortillas were created by peasants who tried to appease the hunger of their king. In the early 1500’s Spanish conquistadors discovered that Mexican Aztecs made flat corn breads that were significant to their diets. The breads added a starch, protein and served as their main source of energy. The Spanish named these breads tortillas (little cake). The Aztecs took raw corn, dried it, and ground it to corn meal, eventually making it into corn dough or masa. They would then take a small ball of the masa dough and press it until it was about six to eight inches in diameter and place it on a griddle to cook quickly on both sides. For the next four centuries, the Spanish, Indians, and Aztecs continued to follow this method of hand making tortillas. To meet the growing demand for tortillas in the United States, the traditional process was mechanized in the mid-20th century. The 1940’s saw significant advancements in making tortillas, small scale gas engines and electric motors powered wet grain grinders to make masa. Still, masa was hand pressed into the shape and size of tortillas. By the 1960’s small-scale tortilla machines could make a shell in two seconds. Now, because of America’s large consumption of tortilla shells, they have gone from an ethnic food to a staple in American diets. Tortilla shells have been molded into many alternative food types like tortilla chips. Tortilla chips are also only second in the list of American’s favorite snack behind the potato chip. Native Mexicans commonly use tortillas as an eating utensil, but in the Old West, cowboys saw the versatility of the tortilla and began stuffing it as a convenient way to eat by the fire. Stuffing the tortilla transitioned into many different wraps, burritos, quesadillas etc. The Tortilla Industry Association (TIA) is an American company based out of Arlington, VA. They estimate that Americans consume approximately 85 billion tortillas a year. The TIA argues that Americans eat so many tortillas because they are an amazing healthy alternative to bread. Tortillas are a naturally gluten-free, low-calorie and low-sodium food and easily replace many other high-carb foods. People can use them to replace noodles in lasagna, pizza pie crusts and make sandwiches into wraps! Both the versatility and health benefits of tortilla shells have made them extremely popular in both Mexico and the United States alike. If you are interested in learning more about traditional Mexican foods, be sure to read our blog. Or, if you are interested in trying out some delicious Mexican cuisine, we always have a side of tortillas readily available! Be sure to come by one of our many Mexicali Fresh Mex Grill locations throughout Massachusetts and Connecticut!